No 10 has condemned the killing of Ahmed Yassin as "a setback... there is no point in pretending otherwise". The spiritual head of the Palestinian militant group Hamas died after being hit by an Israeli missile. The attack which came as the leader returned from a mosque in Gaza, also killed eight others and wounded many. The killing has sparked huge protests. Tony Blair's official spokesman said: "It goes without saying that the PM condemns today's killings." He added: "We repeatedly made clear our opposition to Israel's use of targeted killings, but equally we recognise Israel's right to protect itself from terror. "But any steps should be within international law and should not be disproportionate or excessive." 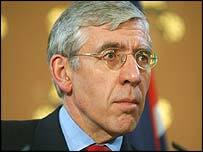 Earlier, Foreign Secretary Jack Straw, who is in Brussels for EU talks on counter-terrorism, called for restraint on both sides. "All of us understand Israel's need to defend itself against terrorism which affects it, within international law." But he said this did not entitle Israel to carry out "this kind of unlawful killing, which we all condemn". "It is unacceptable, unjust and very unlikely to achieve [Israel's] objectives," he said. Shadow foreign secretary Michael Ancram said the killing of Ahmed Yassin represented a "regrettable escalation" of violence in the Middle East. "I quite accept the right of countries to protect their citizens and this man may well have been the instigator of many terrorist acts against Israel, but I think the sadness of this is ... there is no military solution to this," he told BBC Radio 4's Today programme. "The only resolution of the problem in the Middle East is going to be through talks and that solution is further away now than ever." Mr Ancram said everyone knew the answer to the Middle East situation was a "secure" Israel and a "viable" Palestinian state alongside it on the West Bank. Once the peace process resumed, America, the UK and other parts of Europe, "have a role in encouraging that dialogue forward", he said. "But I don't believe you can fight your way to the [negotiating] table, that you can actually bomb, shoot or kill your way to the table. "I think it has to be done by building confidence and restoring confidence and I'm afraid what has happened today is the antithesis of this," Mr Ancram added. Sir Menzies Campbell MP, foreign affairs spokesman for the Liberal Democrats, said: "It is hard to think of a more provocative act than this. Assassination as an instrument of foreign policy is illegal, and has a long history of making matters worse. "The killing of Sheikh Yassin in this way will put back for months any prospect of negotiation." Anas Altikriti, senior spokesman for the Muslim Association of Britain, said: "We welcome the comments by the Foreign Secretary Jack Straw this morning and the condemnation that has been expressed throughout the world." "In Gaza, Sheikh Yassin's funeral has begun"
"It [Israel] is not entitled to go in for this kind of unlawful killing"